When the holidays are approaching, I love to try out new recipes. 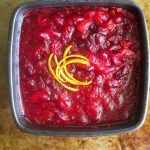 There are so many different ways to make cranberry sauce, but this Negroni Cranberry Sauce is a new favorite! It really doesn’t take much to make cranberry sauce and there is always a batch made around here during cranberry season, not just for Thanksgiving. My kids are like me and love the tart flavor in this delicious berry. There are so many things to make with cranberry sauce and especially leftover cranberry sauce. Like I said, we love it so much there’s hardly any leftover to experiment with. These slow roasted turkey wings are so good and made with a cranberry sauce glaze. Look at these gorgeous cranberries just ready to burst! We have had so much fun these years celebrating Thanksgiving with our Italian neighbors. As soon as we moved in, they became part of the family (or we became part of their family!). Whenever we went to any of their celebrations it reminded me of my Italian family parties as a little girl here in the States. At most of the holiday parties we would usually start with a simple broth and pastina (I love pastina). We would quickly progress to different antipasto dishes and cold cuts. These days, it is usually some of my Calabrian mother-in-law’s salami, capicolla or both, some different cheeses, bread. It is the perfect food to nibble on while the turkey is roasting. There are side dishes already made and just heating up. Once you’re done snacking on all the antipasti and small bites, it is time to slice up the lasagna and you have to leave room for the turkey! At this point, does it matter that there is turkey? Of course! The best part of making the turkey meal is the leftovers the next day. I know some people that just don’t like leftovers; not a problem in my family! In my family, there was enough food for days after the holiday and this is even after sharing with neighbors or some of the guests. I know, we Italians sometimes exaggerate with the food portions!! Did you know that there is a Harvest Festival celebrated in certain regions of Italy. It is usually during September and it is a time to be grateful and thank God for a successful harvest season. Festa del Ringraziamento, referring to a number of religious holidays observed throughout the year for patron saints.Even though Thanksgiving is not an Italian holiday, it certainly has become part of the lives of the Italian immigrants that settled in America (like my dad and my husband) and it is celebrated. And for those Americans that do find themselves in Italy during Thanksgiving (think Julia Roberts in one of my all-time favorite movies-Eat Pray Love) and need to shop for the big day or you just wanting to impress you friends with some Thanksgiving foodie terms on Thanksgiving Day (il giorno di ringraziamento), here you go! 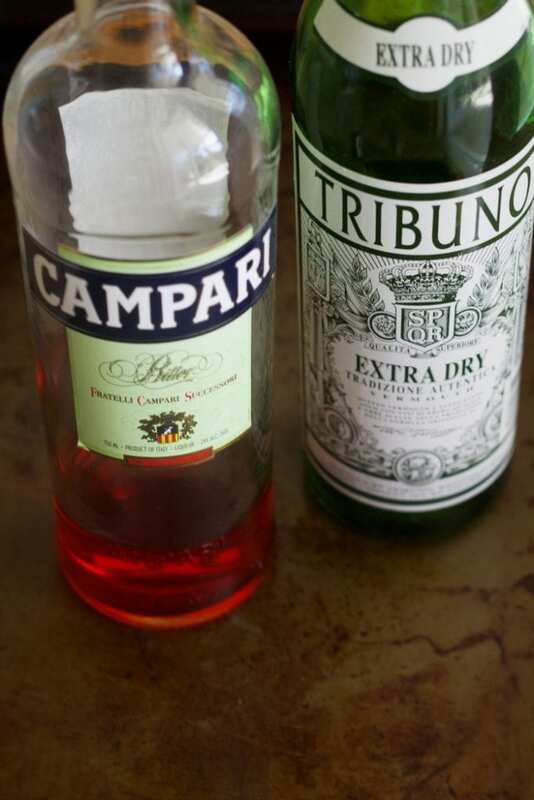 I usually have Campari, vermouth and gin around. If you don’t have any of those drinks or if you prefer to make it without alcohol, just use orange juice. I make it for my kids with just orange juice. It’s so simple to make! 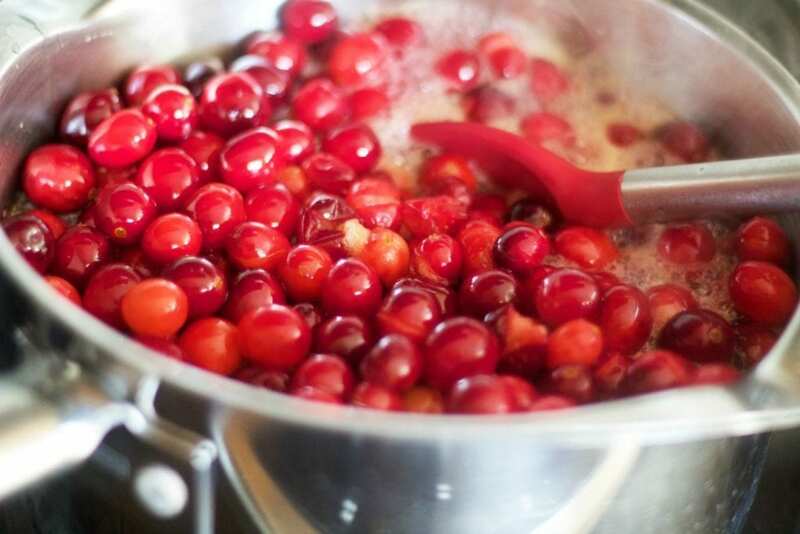 If you are using frozen cranberries, it will produce more liquid, so cut out some of the water. You could always add a little more in at a time if you want it less thick. We like our sauce more on the thick sauce. You may be wondering what to do with leftover cranberry sauce. Mark Bittman has some fun ideas over here. This turkey pot pie is so just delicious!! What is your favorite thing to make with leftover turkey? And if you are a negroni fan like me, read about aperitivo time in Italy and learn how to make your own Negroni Sbagliato. A fun way to enjoy the season's fresh cranberries. Feel free to use only orange juice instead of the alcohol. Heat water and sugar to boiling in 3-quart saucepan over medium heat, stirring occasionally until the sugar dissolves. Add in the next four ingredients. Continue boiling 5 minutes longer, stirring occasionally. Stir in cranberries. Heat to boiling over medium heat, stirring occasionally. Continue boiling about 5 minutes longer, stirring occasionally, until cranberries begin to pop. Simmer for about 20 minutes. Don't worry if every single cranberry does not completely pop. When the sauce is cooked, spoon out the orange pieces. Pour sauce into bowl or container. Refrigerate about 3 hours or until chilled. This is just beautiful! I saw it on Facebook and it really caught my eye! Love the idea of adding Negroni to traditional cranberry sauce! Now this is a cranberry sauce I can stand behind! Oh wow. Your cranberry sauce sounds killer! I must try it! 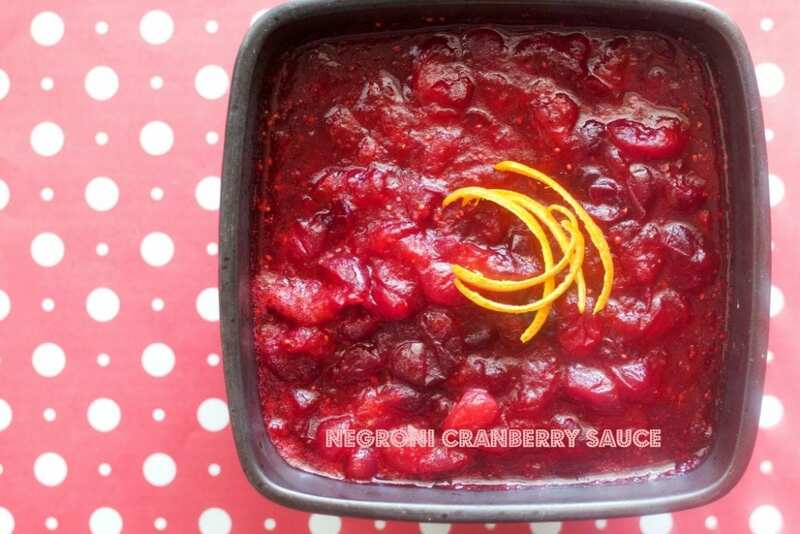 This cranberry sauce is gorgeous! Those Cranberries are beautiful! I can't wait to make this! I tend to agree with you, the best part of the turkey is the left overs the next day!! This cranberry sauce looks fantastic! I love your Italian Thanksgiving food word list! When did you move to the US? Or were you born here? For some reason, I thought you moved to the US when you were an adult! Lol. Whoops. 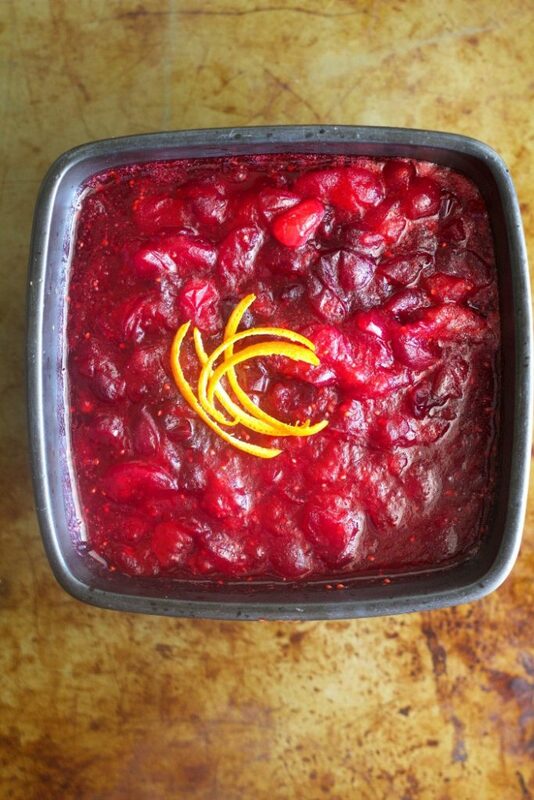 Love this fancy cranberry relish!! I'm all for putting alcohol in all the things! I live for cranberry relish! I don't get it often enough! I'm with you, Thanksgiving leftovers are the best and your cranberry sauce sounds perfect! Well, well…. I'm seeing this too late for Thanksgiving but what the heck, it looks too good not to make for Xmas!